Realmilitaryflix is the ungainly name for a remarkable new source of online video. The site has been put together by US Air Force combat camera veteran John Corry, who began building up a collection of war films while producing a television series in 1991. The site comprises 650 films (with 1,200 more promised by the end of the year), and ranges from the First World War to Iraq and Afghanistan today. Military enthusiasts can scour the decades of conflict; here at the Bioscope we concentrate on the silent material from the 1914-1918 conflict, which is significant enough in itself. Realmilitary flix says “If you only watch one WWI film, make it this one”, and it’s not far wrong. 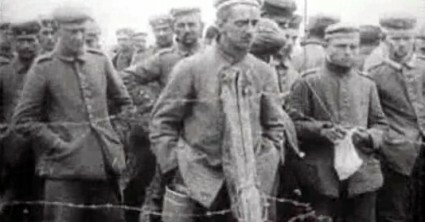 This dynamic four-part compilation was made up of American military film after the war, and the material was expertly edited to form a general narrative of American participation in the war 1917-1918. Its correct title appears to be Flashes of Action, and the National Archives and Records Administration’s ARC catalogue identifies it as c.1921 (many of these films of this site are duplicated in NARA, and some of the descriptions come from NARA’s records). It is filled with vivid scenes of the kind we expect to see of the war, leavened with plenty of human detail. This 1916 production is a single person’s effort – the redoubtable Donald C. Thompson, an independent and resourceful American cameraman who filmed British, French, Belgian, Russian and German troops over 1914-1916, speaking volumes for his diplomatic abilities. He was with the French army at Verdun, where he was wounded, and from which conflict much of this film derives. The quality of the footage is evident throughout, while some of it is startling – apparently close shots of trench warfare (one should always be suspicious of footage where the cameraman would have been in peril e.g. being positioned above the trenches), the shooting of a spy (before and after), and shots of corpses and skeletons. This, as it says, is a German-produced film, made in 1917, which was captured by the Allies and subsequently released as The Notorious Cruise of the Raider ‘Moewe’. It follows the German raider ship Moewe as it captures Allied shipping, several examples of which are shown sinking. Its breezy tone comes over as all the more startling having the matter-of-fact titles translated into English. This is British official film taken in Palestine and Mesopotamia 1917-1918. There is some very impressive footage here, including a gunboat firing on the Tigris and striking aerial photography of a British convoy at sea. 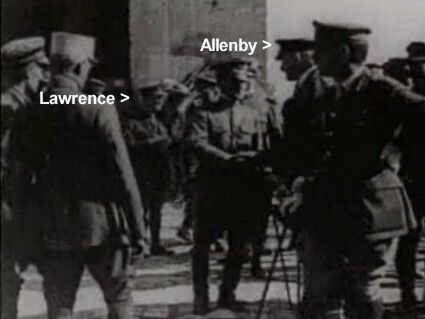 It ends with famous, iconic footage of General Allenby entering Jerusalem in December 1917, with fleeting glimpses of Lawrence of Arabia (in military uniform), if you know where to look. And there’s much more: demonstrations of gas warfare, the operation of observation balloons, the construction of dummy soldiers as camouflage, radio operations, black troops, and the peace treaty negotations at Versailles in 1919. As indicated, one should always take care assessing the authenticity of war footage from this era – the cameramen were frequently brave, but they were severely limited by both equipment and army officialdom, and of course had to preserve their own lives. Overly dramatic footage (always consider where the cameraman was positioned when the film was taken and then ask why he wasn’t killed) may show genuine action but may equally have been staged. That said, there seems relatively little fakery here, just much startling footage intercut with skilfully-shot scenes of the mundanities of warfare which somehow bring it home all the more to us today. All of the titles are available in Flash, and look OK blown up to full screen. One notable last point to make – all of the contemporary films of the war are shown silent. Go explore.